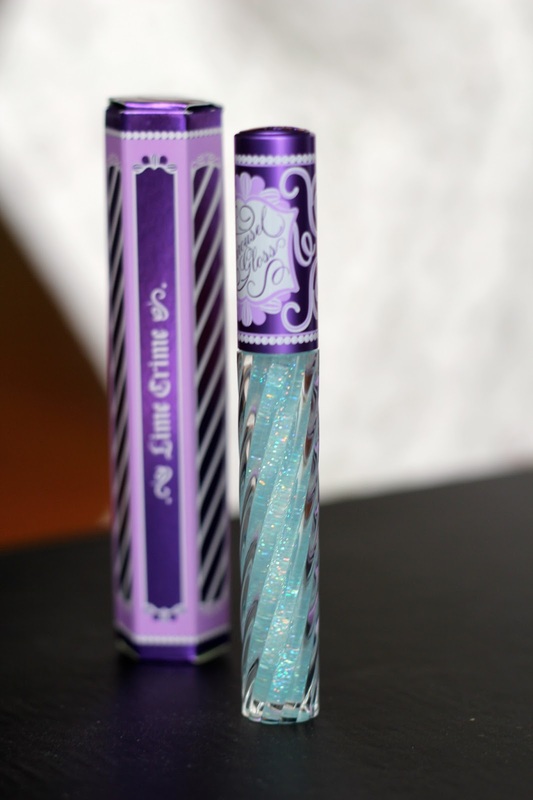 I picked up one of Lime Crime's Carousel glosses recently, in the shade Snowsicle. Their make up line is known for its vibrant array of shades that also deliver strong opacity and pigmentation, but this particular gloss caught my eye as it's advertised to be clear with rainbow glitter particles in it. The product looks absolutely gorgeous and icy blue in it's tube (really pretty packaging too). On bare lips however it is quite transparent even with a couple of applications. The glitter is lovely but not as noticeable as shown on Lime Crime's website photo, you could of course pack it on to make it more sparkly but after two layers I found it started to get goopy. It wears nicely throughout the day and is comfortable on the lips, being quite moisturising but not too sticky. I've heard some reviews saying that you can feel the gritty texture from the glitter on the lips but this was not the case for me. I think it would make a very nice every day gloss or layered on top of a coloured lipstick for some extra wow factor. Oooh I can see the glitter - yes it's not very noticeable so it won't do well for clubbing haha! But def very good for a day out with friends :)! I have a few of their products and I love love them but agree that some of their photo's do not reflect how it appears on your own face/skin. I still like their products nonetheless. Oww, Now I not one for Lipglosses but this would look lovely over lipstick :) Really pretty shine and giltter to it! i'm not a lipgloss kind of person but the packaging is so sweet. i love it.